Our Hudson Valley region summers generally bring wonderful weather with dry air and cool nights. Our autumns are spectacular with their foliage. Our winters are dreadful, and once again it is that time of the year. We stoically accept the onset of another cold season and make do with the holidays as some sort of compensation. Few of us, however, know or even wonder why we must endure this annual season. Do you? Some of you might be able to give a reasonably good explanation for our winter season in terms of the Earth’s orbit about the Sun. Many of you, however, might flub the story; it is, after all, just a bit complex. But what if it were the other way around? What if the quantities of carbon dioxide were declining instead of increasing? That gets us to a term which is rarely used – the “Icehouse Earth.” That’s a notion few have been much worried about nowadays, but it actually has happened, and that gets us back to what isn’t above you. In earlier columns we wrote that there were, in the distant past, great mountains towering above our Columbia County region along with most of western New England. These mountains are called, by geologists, the Acadians. They should not be confused with today’s small Berkshires. The Acadians were big; they rose to elevations of tens of thousands of feet and that was right here. That was during the late Devonian time period or about 375 million years ago. This had been a time when the world was truly a Greenhouse Earth. There was actually 16 times as much carbon dioxide in the early Devonian atmosphere as is today. That greenhouse effect must have been enormous; tropical climates prevailed across the planet. But it was not to last. Here in today’s New England, our rising Acadian Mountains were subject to chemical weathering and erosion. Those processes converted the Acadians into sediment which, eventually, hardened into rocks deposited across the rest of New York State. What is critical here is that the processes of chemical weathering consume carbon dioxide; they take it right out of the atmosphere. As the Acadians weathered away, the amounts of carbon dioxide in the atmosphere dropped dramatically, from 16 times as much as today down to merely today’s levels by the end of the Devonian Period, about 360 million years ago. This, as you might guess, resulted in a reversal of the greenhouse effect and quite a cooling of the climate. In fact, there was an early ice age at the end of the Devonian. There is plenty we don’t understand about this story, but this was a turning point in Earth history. Carbon dioxide would never again be as abundant as it was during the early Devonian. Its levels would rebound again during the age of the dinosaurs and those great monsters certainly must have enjoyed the temporary restoration of the greenhouse warmth. But there simply would never again be so much carbon dioxide, and the climate would slowly deteriorate, with cooling temperatures, especially during the last 60 million years. Winters, which probably had not been much of a problem during the early Devonian, slowly became longer, colder and more distinct from the rest of the year. Thus, what we know as seasons made their appearance. The process has continued right into our time. In reality, even if industrial pollution continues unabated, ours is a time of an Icehouse Earth. So, were our old Acadian Mountains responsible for winters? Well, that’s a bit of a stretch, but it is fair to say that the many processes that came to produce and then destroy the Acadians were all part of a climate machine that eventually created the Icehouse Earth climate that we can look forward to for the next three or four months. To a geologist a very long time is, well, not so long. When we visited The Vanderbilt and Roosevelt homes recently, we noticed that the two had something in common. Both are built upon the same geological foundations and both, eventually, will face the same fates. 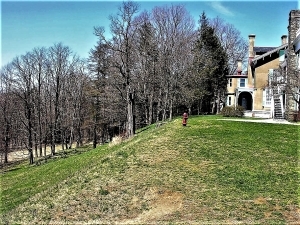 Wander around the grounds of the Vanderbilt estate. You will very likely enjoy seeing an abundance of very old and very large ornamental trees. And then there is the house itself, it’s quite a sight too. What you probably won’t notice, at least not right away, is how flat the grounds are. This is no accident; we are looking at the top of a delta that once stuck out into a lake that was here. That delta was part of Glacial Lake Albany, the great ice age lake that once filled the Hudson Valley. Delta tops, more often than not, are flat as a pancake. The fine-grained muds that accumulate upon them settle down in flat sheets. But Glacial Lake Albany is long gone, it drained about 14,000 years ago and that left the delta high and dry. The whole town of Hyde Park is one large dry delta top. That’s what made the Vanderbilt site such a desirable location. The house sits upon a high flat delta top, commanding a very fine view of the river. The Vanderbilt’s couldn’t resist it. All this is the case for the Roosevelt home and many, many others. But scenic though these river view sites are, there are long term hazards. 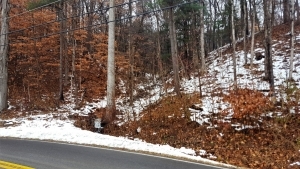 Just in front of both the Roosevelt and Vanderbilt homes are steep, almost vertical slopes. This is not accidental, there is a pattern here and nature is sending out a warning. These steep slopes are the headwalls of what geologists call “slumps.” What has happened here is that large cohesive masses of old lake muck have detached along curved fractures and slid downwards. This is an intermittent phenomenon, it happens occasionally during relatively brief periods of movement and then there is little activity for very long periods of time. The hazard is thus somewhat like that of an earthquake: long periods of quiet, interrupted by moments of destructive activity. What triggers a slump? Most likely a period of very wet weather. The old lake sediments become waterlogged and unstable. They become very soft and go through an episode of slumping. By the time that is over, the climate has probably dried out enough to delay further action for another long while. Wander the grounds of these fine old mansions and you will soon find a number of large semicircular slump features, right at the edges of the old delta. These are places where, long ago, slumps occurred. At the bases of those large semicircles the ground is hummocky. Those are the downhill scars of the old slides. The landscape speaks to us of slumps long past, but it also speaks to us of slumps yet to come. That’s what this column is all about. Someday, probably a very long time from now, the very land beneath these fine old mansions will become wet and unstable. The earth will heave and some or even all of the mansions will collapse. It’s a sad fate for some fine old mansions, but Nature does not discriminate in favor of the wealthy, Nature does not care. It’s November and the hiking season is winding down. There are still a few relatively mild days, but there are so many fewer reasons to get out now. The foliage with its green is gone and the landscape is for the most part just a dull gray. Darkness comes so early now. Later the snow may draw some of us out on skis or snow shoes, but that is yet to come. For the time being the scenery is uninspiring. 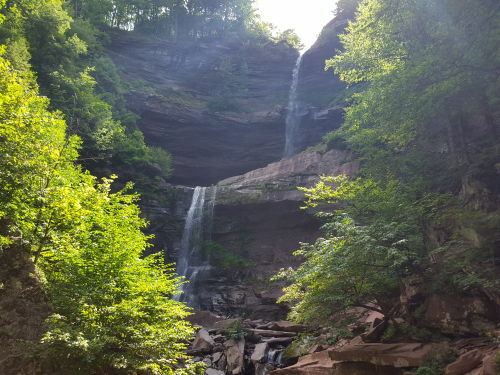 But we have found that there is one outdoors experience which is pretty much confined to this time of year, and it is something that does sometimes draw us out for one last end of the season Catskill hike. It’s not something that we can go and see, nor something that we can hear or feel. Instead it is the very silence of the woods at this time of year. Each November brings a few days when the skies are a uniform gray, and the gloomy weather patterns seem to settle into complete doldrums. Pick one of those days and hike high up into the Catskills so that you are far away from any road noise. There are usually no planes above our mountains, but if so just wait until they have passed by. Pick a good spot and sit and listen. Not a breath of air stirs, and even if it did a little, there are no leaves to rustle at this time of the year. Once in a while a twig will fall, but these events are scarce and momentary. The forest becomes so completely silent that it is almost unnerving. In this season of the year there are few animals stirring. The insects are seasonal, and this year’s generation has all died; the next generation sleeps in its egg cases, silently awaiting the spring thaws. The song birds have departed, and most of the ground animals have settled into some burrow for the winter. In short it is mighty quiet up in the mountains at this time of year. To a geologist there is a special experience here. Silence is unusual in our world, but that is only our world that we are talking about. Today we expect the woods to be noisy with insects, birds and furry animals, but that has not always been the case. Long ago these noise-making creatures did not exist. We are thinking of the Gilboa Forest which long ago presided over our Catskill landscapes. The Gilboa Forest was a very different sort of woods. There were no furry animals, neither were there birds. There were insects, but they were so primitive that they had not yet evolved the ability to make noise (or even hear it). Noise making is something we take for granted, and probably regard mostly as a nuisance. But we should not forget that it is a relatively complex form of animal behavior and that was something far beyond the abilities of Gilboa’s primitive creatures. Neither were the trees of Gilboa very noisy. They lacked true leaves and so it is not likely that they would have been able to make much of a rustle. Even on a windy day, the forest of Gilboa must have been a remarkably quiet place. 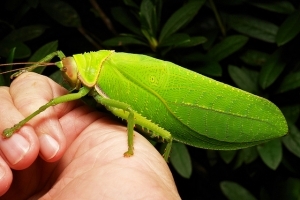 All this silence ended, maybe 300 million years ago, when more advanced insects appeared and began their songs. Eventually birds and other animals followed suit and the world’s forests and jungles became noisy. So that is what draws us into the mountains at this time of year. It’s a chance to go and experience a form of nature that has been gone for all those 300 million years. We like the western slopes of Hunter Mountain. These face the interior of the Catskills and are shielded from the cacophony of the Hudson Valley. Near Woodstock we would hike up to Overlook Mountain and turn down the yellow trail to Echo Lake. On a real quiet day, the lake’s name should truly be a misnomer. Try it; it’s this year’s one last good excuse for a hike into the mountains. guess that anything here is really nationally known. Nevertheless, in geology circles, there is one nearby spot that is truly famous. This location is known as the Becraft Hills or, to many geologists, Becraft Mountain. You would be amazed to discover how many geological maps of this site are found in college level geology lab manuals. Every semester thousands of geology students do exercises involving the geology of the Becraft Hills. And they have been doing them for generations; there is some classical geology here. You can join in; travel south on Rte. 9 from Hudson and look way up above. You will see some stratified rocks, limestones, high up there. You may not be able to tell it, but these strata are inclined to the east. Continue south and turn east (left) onto Rte. 23. 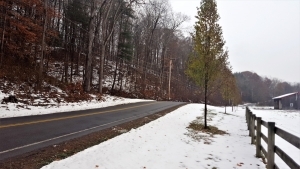 At the intersection of Routes 9 and 23 you are at the southwestern corner of the Becraft Hills. Before you will be an outcropping of gray limestone. That’s typical of the hills and it is part of what makes them remarkable. 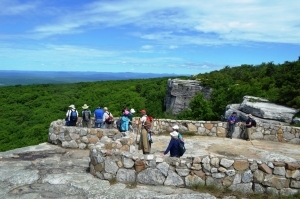 These limestones are an isolated bit of the Catskills. 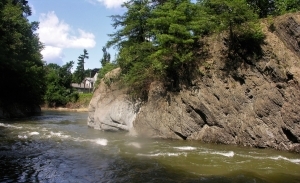 The limestones, called the Rondout and Manlius Formations, make up the very base of the Catskill sequence west of the Hudson River. They are the very foundations of those Catskills. As we said there is the whole lower Catskill sequence here. The Becraft Hills have several units of black shales as well. And this stratigraphy speaks to geologists; it tells us that once, long ago, the stratified rocks of the Catskill sequence extended eastward, across the Hudson, and blanketed much or all of Columbia County. How could that be? The structure tells all; we already saw that the strata on the west side of the Becraft Hills mostly are inclined to the east. Continue east on Rte. 23 and turn left on Fingar Road; make another left on Hiscox Road, and one more left onto Rte. 29 (aka Spook Rock Road). Now to your left (west) you will see some fine strata of limestone. All these beds are dipping to the west. In short, the western strata dip east and the eastern strata dip west (do you follow that?). That gives the Becraft Hills a bowl like structure, something that geologists call a syncline. That takes us back to a time called the Devonian, a little less than 400 million years ago, when the mountains of western New England were being formed. 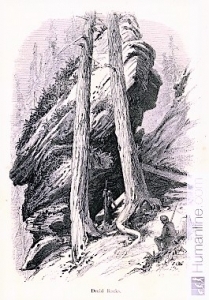 The mountain building event was called the Acadian Orogeny and it involved a lot of uplifting of all the area’s bedrock (after all you have to have uplift to form mountains). You also get a great deal of folding of the strata and that is how we formed the Becraft sequence. We should say protected the Becraft sequence. Mountain building uplift should have elevated the Becraft Hills and subjected them to processes of erosion that, in the end, would have destroyed them. Instead the Becraft strata were folded downward into the bottom of that syncline bowl where they were protected from erosion. All across the rest of Columbia County the Catskill sequence eroded away, but not here.
. Geologists sometimes call such an erosional remnant an outlier and, by itself this would make it worth the visit of a geology class, but there is more. The Becraft Hills, it seems, are also shot through with faults. You have heard of the infamous San Andreas Fault and you know how earthquake-prone all of California is. Well, back during the Devonian time period, those nearly 400 million years ago, Columbia County was something of a California-like earthquake zone. Those ancient faults, now long inactive, can be seen and mapped by geologists. All this is something that geology teachers cannot resist. Every year scores of geology field trips visit the area. Watch, come next spring, for the large vans with school names on their sides. Look for a dozen or so scruffy college age kids happily climbing about on the rocks. These are field trips and they are a real institution among geology departments. And they have been for a long time. The first geologists started studying here in the 1820’s. A century or so ago the area became a popular location for summer field geology courses. Back then, before cars were available, the relatively large number of geological features in a small area made this a very practical place to teach and learn geology. We wish we could see some of those old horse and buggy field classes. Generations of young geology students cut their teeth on the rocks here. Later, when transport had improved considerably, it became preferred to travel to the American West to do full-fledged field camps. some geology and a very large number of young geologists still come here. Take the tour yourself. The sinking of the Titanic is one of the great stories of history. It’s complete with drama, heroism, and even suspense–despite the inevitable ending. Throw in a little romance and no wonder that the current movie has been such a hit. Part of the movie’s success is the allure of the deep. The ocean’s great mysterious abyssal plain retains, even today, a compelling fascination. To scientists, however, equally gripping was the story of the discovery of the sunken liner. You remember it. Intrepid oceanographers, from the Woods Hole Oceanographic Institute, descended to the depths of the ocean’s great abyss in tiny submarines. Powerful headlights shined upon the sea floor and then upon the long unseen wreckage itself. What an incredible moment! The substance of fiction became history. The depths of the seas had long been shrouded in mystery, and to see actual film from the deep is one of the great achievements of our times, certainly ranking with anything that our space programs have achieved. Much of the abyss is monotonous mud, but there are those many shipwrecks, and a whole exotic ecology of truly wondrous and intriguing animals. All of this imagery is made even more appealing by the seeming impossibility of traveling to the bottom of the deep sea. Few of us, after all, get invitations from the Woods Hole. If you could visit the great abyss, would you leap at the chance, or would you shrink from the real danger of the journey? Would a good movie be enough, or would you have the adventurous streak needed for that perilous trek to the very bottom of the sea? It is dangerous; people have died down there. Let’s make it easy. We can have you onto the abyss in probably a bit less than an hour and it will be no more dangerous than a short car ride. Find your way across the Rip Van Winkle Bridge and then go exploring. It doesn’t much matter which way you go; you soon find outcroppings of black sedimentary rocks. There is nothing figurative in our remarkable claim; this is really the bottom of a sea–or it was. Rising along the sides of the roads are cliffs of dark black shales with occasional sandstones. These accumulated at the bottom of a deep sea, one that was here nearly 450 million years ago. It can be called the Normanskill Sea and the layers of rock you see here were once the muds that made up its bottom. It’s a curious thing, but way back then, the Ordovician time period, most of New England was rising into a substantial mountain range. These, the Taconic Mountains, would reach heights of maybe 15,000 feet, and perhaps a lot more. As they were rising, however, the crust of the adjacent vicinities, including today’s Hudson Valley, became depressed. Given time, a fairly substantial deep sea was produced. How deep? We don’t know for sure, but it might well have rivaled some of the deep marine trenches of today’s Pacific. It was a still, mud-bottomed, dark and very silent ocean floor. Much of the roadside exposures are thinly bedded, black shale. That was the mud. Those layers piled up slowly over uncounted centuries. Each thin horizon had its moment, each was once the sea floor. With time, another and then another thin seam of mud would accumulate. As the weight piled up the mud was squeezed and hardened into shale. The dark sandstones are somewhat different. These were more active influxes of sediment, moments when masses of sand tumbled into the depths. There were living creatures at the bottom of this sea, but few large enough to leave fossils. They lived quiet lives in the Normanskill Sea; no crashing ocean liners interrupted their lives. Scientists did come and visit them, but not until nearly 450 million years after their deaths. Dear Professors Titus: I dug up this unusual rippled rock in my garden. Can you tell me about it? Did it form at the bottom of the sea? Norma Coney, Gilboa. Dear Mrs. Coney: We are glad to have your letter and photo and we are happy to write about these interesting sedimentary structures. They are striking features and they are important. Geologists find them throughout the Catskills and in many other locales as well. They are called ripple marks, but that term does not explain itself very well. 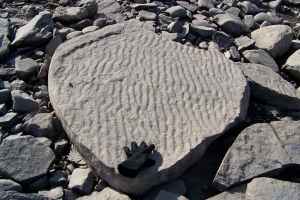 Ripple marks can be the product of several processes. They can, indeed, form at the bottom of the sea, but in your case that is not likely. Gilboa was part of the Catskill Delta back during the Devonian time period when your rocks were formed. We need an explanation which does not involve saltwater and we think we can come up with one. The first process that forms ripple marks is current activity. Currents, moving along the bottom of a body of water, tend to sweep up particles of sand, along with a little silt and clay, and carry them along. If there is a strong current, then the first few inches above the bottom will be dirty with the sediment. The current sculpts the sediment and shapes it into the ripples that we see. You can tell current ripples because they are asymmetric. There is a steep, but short, downstream slope on one side of the ripple. The other side has a lower angle and that side is the longer of the two. Sand grains are swept along and travel up the long, low slope, called the stoss slope. 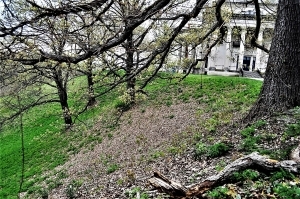 After they kick across the crest of the ripple, they tumble down the short steep slope, which is called the slip slope. The result of all this is an asymmetric ripple, steeper on its slip slope than its stoss side. These are common on the floors of shallow oceans and at the bottoms of rivers. The stronger the current was, the larger they are. The other process that creates ripple marks is wave activity. Waves are simple looking when you watch them approach a shoreline, but they are actually pretty complex. Inside a wave are masses of water that are traveling in circular orbits. Each drop of water will travel in its orbit as the wave passes by any particular spot. In effect the drop travels forward as it rises up the slope of one side of the orbit and down the other. Then the water drop is, in effect, traveling backwards as it completes the bottom half of its cycle. Watch the second hand on a clock as it travels “forward” toward three o’clock on the upper half of its sweep and “backwards” towards nine o’clock on the lower half of its sweep. The second hand of a clock does a lot of moving but it never gets anywhere. Similarly, when our drop of water has completed its cycle, it is right back where it started (just as the second hand of our clock passes by 3:00 every minute). The drop of water doesn’t go anywhere, but the motion wave does travel forward through the water. In effect waves are pure motion; the passes through the water, but nothing else actually goes anywhere! But, even if the water does not go anywhere, a wave can move sediment. The circular motion of water inside a wave, sweeps sand forward and backwards at it passes by. That forward and backward motion sculpts the sand into the second category of ripple marks. These, called wave ripples, are symmetrical. Both sides of the ripple have the same slope and each side covers the same distance. Wave ripples can also form at the bottom of oceans or on the bottom of any body of fresh water. Because waves are shallow water phenomena, their ripples tend to form in shallow water settings. Wave ripples are especially common along shorelines. Go to a nearby pond or lake and look at the sand along the shore and see if you don’t find some. Confused? Just remember: asymmetrical means current/ symmetrical means wave. Do watch for these; they are common and fun to find. Now, as to the ripples in Gilboa, It’s hard to tell from the photo, but they appear to be asymmetric. Thus, we think that these are current ripples. If that is so, then these were probably formed by the currents of a Devonian age river. This was part of the great Catskill Delta, which accumulated the sediments that make up the sedimentary rocks of all the Catskills Mountains.